PCI is about compliance, right? Surprisingly the answer is no, it was designed to reduce the risk to cardholder data loss, nothing more. Compliance was the means to get organisation moving towards a secure posture where little previously existed. It worked, PCI has introduced the culture shift necessary to accept what was the inevitable next step; integration of the PCI controls into what's actually most important, staying in business securely. 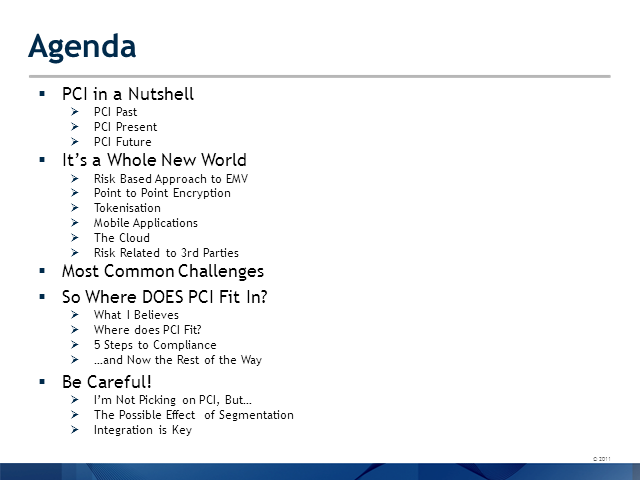 This webinar will attempt to show where PCI was, where it is now, and where it will go based on current trends. More importantly, it will show you where PCI fits into an overarching Governance programme that can provide a true ROI to businesses of any type.